It was the last weekend of September in Amsterdam so we packed blankets and woolen gloves for the late outdoor screening we were going. Even though 2015 is on track to be the warmest year on record, we’ve learned that mid-autumn evening could still be cold in this part of the northern hemisphere. We went to buy some nice bread and wine before cycling to the event organised by Greenpeace. 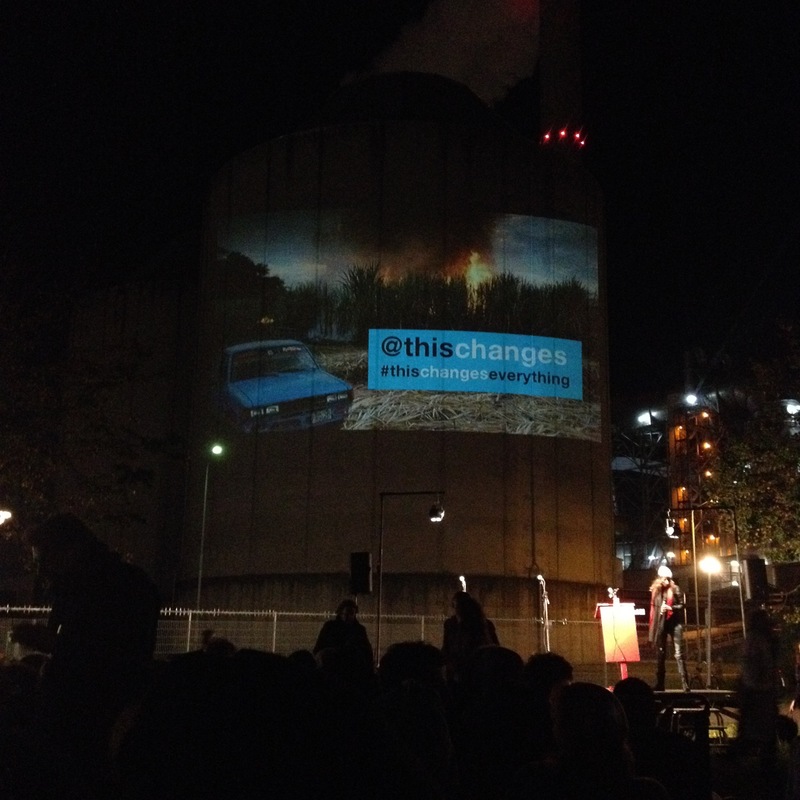 It was a gathering to watch “This Changes Everything” — a documentary made from Naomi Klein’s book of the same title. “The middle-class way of protesting”, we joked. The last sunlight had gone out by the time we arrived at the site of the screening. It was a big field next to a building churning out huge columns of smoke, which we had noticed on the way long before reaching its source. Soon enough had we realised that it is a coal power plant and it would be used as the projection screen for the documentary about fights between fossil fuel companies and people who want to protect their habitats. The irony stroke a powerful message. However, I didn’t go to there to learn about the fights and what they represent. I had read the book. To be more precise, I had struggled through the book for the same reason as why I no longer get on a roller coaster. I am afraid that my heart would give out, physically on a roller coaster and emotionally with the book. It first gave me hope and then despair because the Blockadia stories are inspiring and heartbreaking at the same time. I felt small, powerless, indignant, and ashamed when I read about the greediness and selfishness of many people. I also felt small and ashamed when I read about the bravery and sacrifices of some others because it didn’t seem to me that I have done enough to move from the former group to the latter. I pushed myself through the book, day in, day out looking for answers about the climate crisis. Then one day, I just had to quit reading. I realised reading other people stories was not enough. If I want to make a positive change, it is time to write my story because this is about everyone. This is just not about the people who live around Alberta tar sand mines or about the polar bears. So if you care, make it personal. Change the discourse. Make it YOUR story. You don’t need to a story of a superhero, a more environmental-friendly version of a life story you would tell grandchildren would do amazingly. In the meantime, you are welcomed to read mine. Does it count if I have it easy? Since 2013, I have been living in the Netherlands — the safest place in the world for cyclists thanks to the perfect cycling infrastructure that can be found throughout the country. On the contrary, it can a life-threatening experience if you go out with a bicycle in Hanoi, my home city. So when I changed my way of getting around from the back of a scooter to the front of a bicycle, it almost sounds natural. My daily carbon footprint has dropped, but others might say I have it easy because I live in Amsterdam, and it’s a fair point. I also have it easy because my partner dedicates himself to living green. As a couple, we can afford to pay more money for low carbon footprint products like free-range meats, locally grown, organic fruits and vegetables. We even grow our own chillies. I know it sounds like a comfortable middle-class way of living more than anything else, yet I am glad we are able to stick with the better choice. We’ve made more and more choices that entail using fewer fossil fuels. We take much more train journeys even if it means longer traveling time and higher prices. Last summer, we traveled about 2,000 km by trains (and buses) so we could go places without having to take more than one flight. I know it is probably no sacrifice at all because it was still a holiday. But everything counts. In June, I started working for Fargreen, a social enterprise in Vietnam. We aim to save rice straw from burning, which releases greenhouse gasses, and use it to grow organic mushrooms instead. I haven’t yet gone to the paddy field on hot summer days to do the hard labour of collecting straw. I only do what I enjoy: writing. Maybe I have it easy again, still my work at Fargreen is another block of my story. And in September, I went for the screening of This Changes Everything. I have about four years before the biology clock strikes the warning for the health of my future babies. Four years to see if bringing another baby or two onto this overcrowded earth is a sensible or moral choice. That would be a very tough decision to make. Things are good in Amsterdam, but my family are in Hanoi, which is at least one long-haul flight away. Unless planes start to use renewable energy soon, I’ll make as big a part of the problem as what I can do to help. So this is the story I am writing: things that I am trying to do and what I might fail. I know it is not the story of a superhero, but I believe writing it out helps. Besides, the story doesn’t stop here. It’s hardly the beginning. Next week I am going to Rome to learn about food security. Next month I am going on a Climate Parade here in Amsterdam, and in Paris during the UN Climate Change Conference. Next year? I am not quite sure yet but I will keep writing. This entry was posted in Live. Explore. Learn. and tagged climate change, environment, thischangeseverything. Bookmark the permalink.